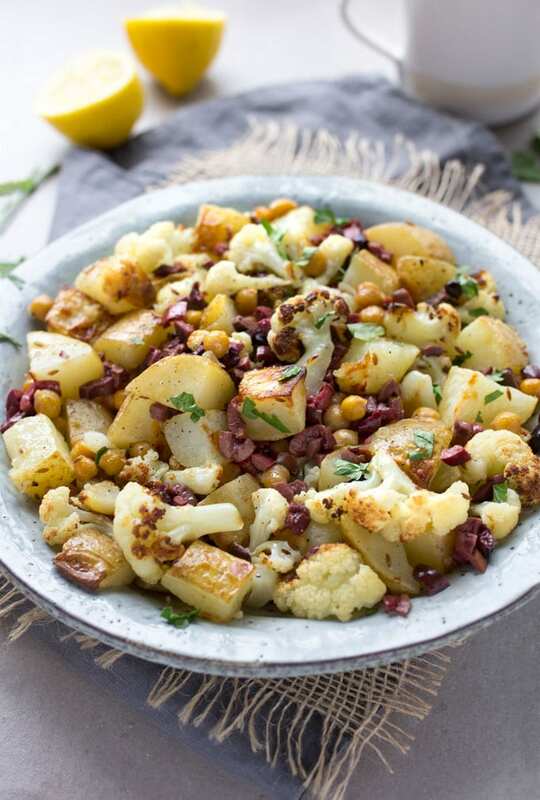 Roasted cauliflower, potatoes and chickpeas are dressed in a bright lemony vinaigrette with bits of rich, briny olives and a kick of cumin. Serve this as a side dish or vegetarian main. This is my favorite kind of recipe – easy enough for weeknights, delicious enough for a special occasion…and healthy. London is staring to feel like home. I’m learning my way around town and around my local grocery store. I’ve started to cook a lot. There’s nothing like a simmering stew or veggies roasting in the oven to make a home feel warm and welcoming. 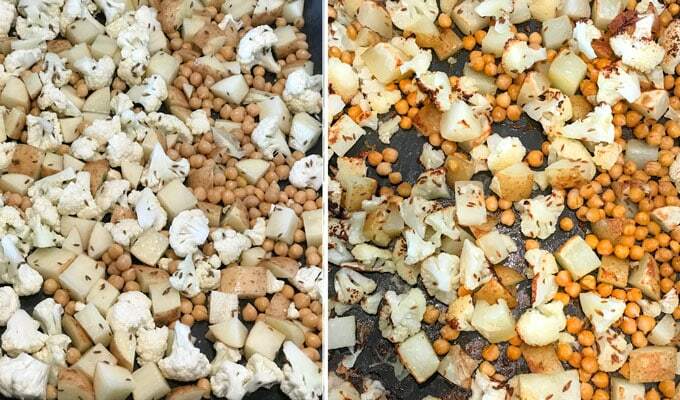 I hosted one dinner party since we’ve arrived and served this roasted cauliflower, potatoes and chickpea recipe as a side dish, along with Mediterranean roast chicken. 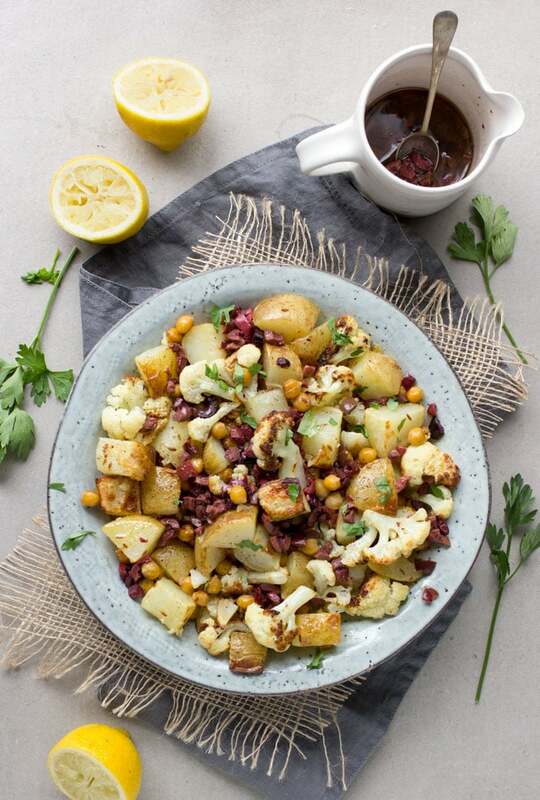 For those of us who love Mediterranean flavors, the vinaigrette on these roasted vegetables is bright and fresh, salty, and lemony. It’s pairs deliciously with the caramelized flavors of the roasted vegetables. While the veggies are roasting, you’ll have plenty of time to make the vinaigrette. 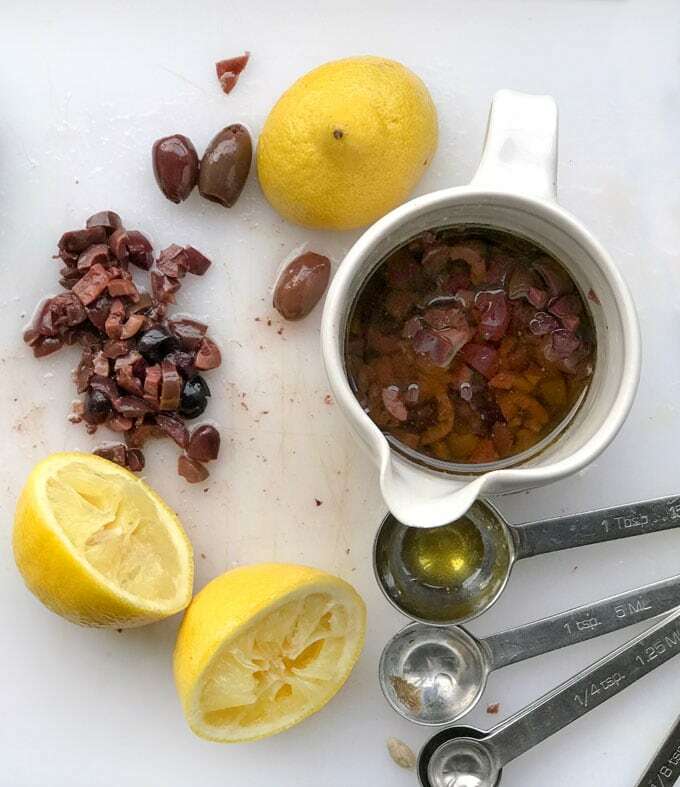 Chop the olives and combine them with olive oil, fresh lemon juice, garlic, salt, pepper and cumin. Toss the roasted veggies in a big bowl with half the vinaigrette. I like to save the other half of the dressing for drizzling after I’ve got the veggies plated in a serving bowl, so there’s a good amount of chopped olives shining on top. 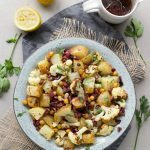 This recipe is adapted from a recipe in Gourmet Magazine for roasted cauliflower with kalamata vinaigrette that I’ve been making and tweaking over the years. I ultimately wanted more variety of roasted veggies. Roasted cauliflower has a sweet nutty flavor. The potatoes roast up buttery on the inside, with crisp caramelized bits on the edges. 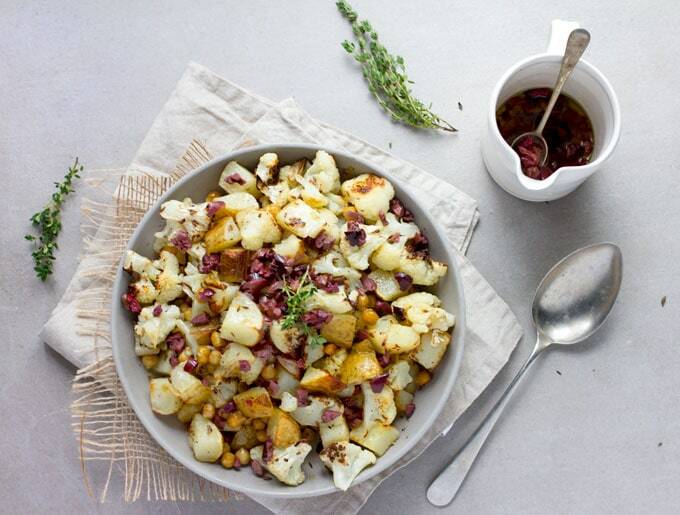 The roasted chickpeas have a wonderful contrasting texture to the cauliflower and potatoes – part crisp, part chewy, and super delicious. I added fresh cumin seeds to the mix. They get toasted in the oven with the veggies and add an incredible kick of flavor. This is a totally delicious side dish. It works with chicken, fish, any kind of roast. It’s also hearty enough to serve as a vegetarian main course. This post is part of the second annual week-long #PotatoPalooza with my friends Maggie over at omnivorescookbook.com and Elizabeth at bowlofdelicious.com and sponsored by The Idaho Potato Commission. 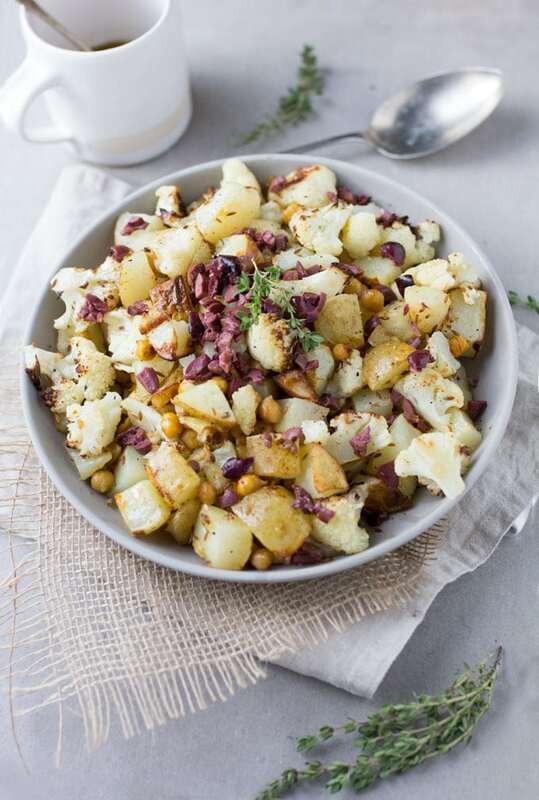 All this week we’ll be posting delicious potato recipes so be sure to follow along! Preheat oven to 425ºF for convection or 450ºF for conventional. 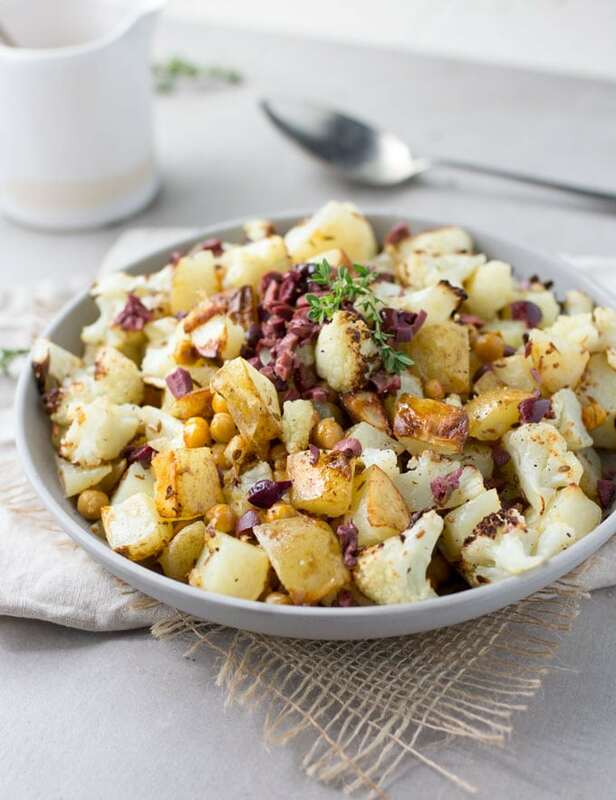 In a large bowl toss cauliflower florets, potatoes and chickpeas with 3 tablespoons of olive oil, cumin seeds, 1 teaspoon salt and 1/2 teaspoon pepper. Spread the mixture out in large non-stick low-sided baking pan or one lined with foil. Roast for 25-30 minutes or until the cauliflower and potatoes are tender and are starting to brown. Make the Vinaigrette: While the vegetables are roasting, whisk olives, oil, lemon juice, garlic, 1/2 teaspoon salt and 1/4 teaspoon pepper. 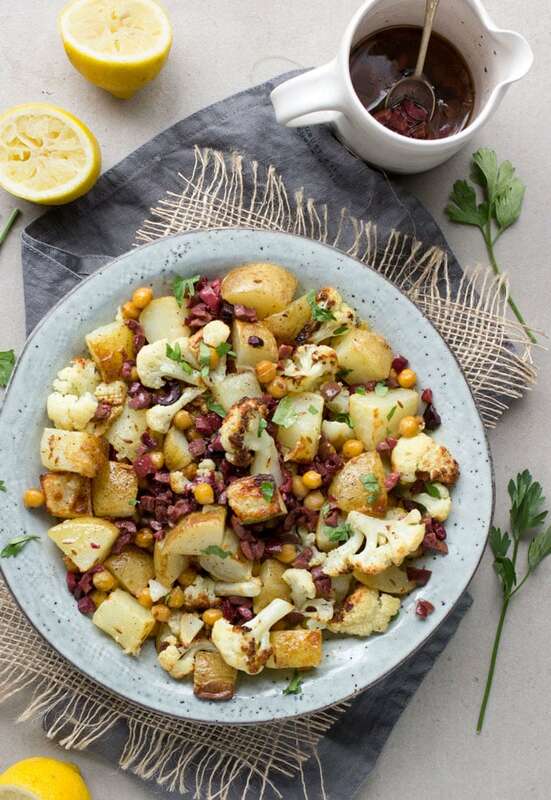 In a large bowl toss the vegetables and chickpeas with half the vinaigrette. Transfer to a serving bowl or platter. Drizzled the rest of the vinaigrette over the top. Garnish with chopped parsley, if you like. Serve warm or at room temperature. This post is sponsored by The Idaho Potato Commission. Opinions are my own, as always. Thank you for supporting the sponsors who support Panning The Globe. One of your fans brought this to Christmas eve bash last night. Delish! I’ll save the recipe and make it myself. I love this blog – I think that your recipes are brilliant! Thanks for being YOU!!!! Awww thank you Lois 🙂 I’m so glad you’re enjoying my recipes. It’s great to have you here!